The Grand Ballroom of The Westin Grande Sukhumvit. 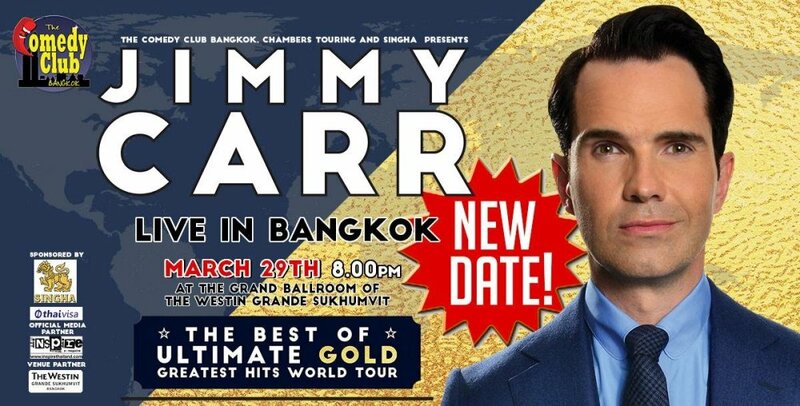 Jimmy Carr - Live in Bangkok must be rescheduled to FRIDAY MARCH 29TH. demand we have added a late show at 10.30pm! The Comedy Club Bangkok, Chambers Touring and Singha are proud to announce the return of one of Britain’s most-respected and best-loved comedians, JIMMY CARR 'The Best of Ultimate Gold Greatest Hits World Tour’ - Live in Bangkok, Friday. March 29th at 8.00pm and 10.30pm at The Grand Ballroom of The Westin Grande Sukhumvit. on 'The Royal Variety Performance'. He has also regularly appeared on shows such as 'QI' and 'A League Of Their Own', was one of the stars of Channel 4's '10 O'Clock Live' and has been a guest on chat shows such as 'The Jimmy Fallon Show', 'The Jonathan Ross Show', 'Late Night with Conan O’Brien' and 'Graham Norton'. Great comedian,and a very bright guy (4As and Oxford). Don’t go if easily offended or a fan of PC. Whatever you do, don't sit in the front row. Dead right. The further back the better. He can turn real nasty in the blink of an eye. funny, not nasty, unless you are a sensitive type of course. Saw a show of his where he was taking the piss out of someone in the front row. It started funny enough but went on a bit too long and the victim gave him the bird. That's when the humour went out the window and it became a bit personal and in bad taste.